I have spent a couple hours the last 4 days trying to broadhead tune my bow for an upcoming elk hunt. I was planning on using Slick Trick Magnums but for the life of me I can not get them to line up with my field points at 40+ yards. At 20 they are close, at 30 they are a couple inches high, and at 40 they are 4~ inches high. So on and so forth the further I move out. I keep moving my rest down and the group is not coming together. The archery tech I've been talking to said I probably ought to just sight in for those broadheads or compensate while I am hunting. 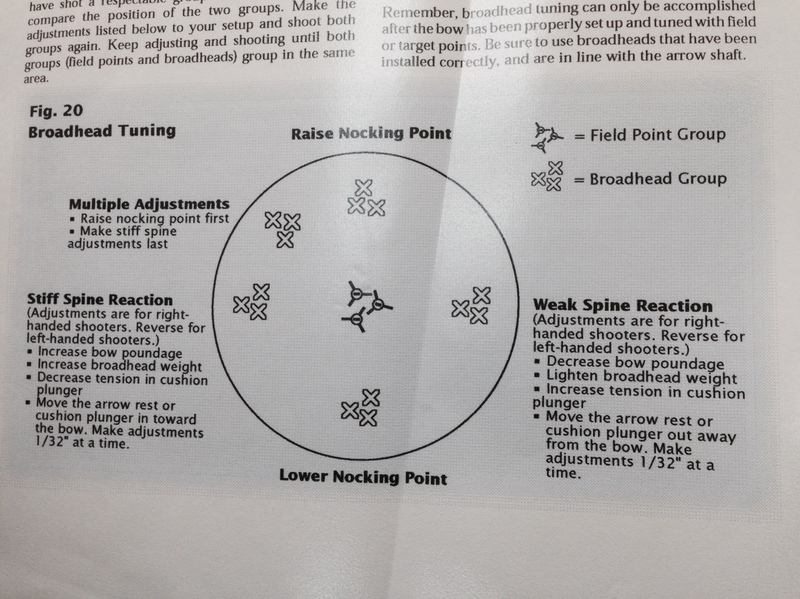 I do not want to sight my bow in for the broadheads and then have to aim at the wrong location while I am practicing (afraid it will enforce bad habits). I also don't want to compensate while I am hunting and end up forgetting and making a bad shot. With all of that being said I've been searching online but haven't seen many reviews on the Jak Hammer 1 1/4" mechanical broadheads. Obviously they will penetrate better than the 1 3/4" model but I was wondering if anyone has any real world experience with these? I am shooting a Mathews Z7, 67lb, 28" draw, and around a 375 grain arrow (all things included) so I have decent KE but not as high as I would like to shoot a big mechanical at an elk. If you have experience with this head would you recommend using it on an elk? I believe your nock point or d loop needs to go up the string just a little to bring the impact of the broad head down. I’ve used both the Jack-Hammer 1 3/4 and the 1 1/4”. The 1 1/4” are just as nasty. From my experience they open a little faster than the longer blades on the 1 3/4 cut. The entry holes were just as big if not bigger on most hits. I shoot 65lbs and at that time my arrows were 400grains. It’s a tough broadhead that zips on through whitetail but I don’t have any first hand experience on Elk. Thanks for the input. I went ahead and ordered some 1 1/4". I don't feel comfortable using a large diameter mechanical on an elk but these 1 1/4" should get plenty of penetration. Hopefully I get the chance to find out first hand how they will perform on an elk! In the past I used the 75gr Wasp Jak Hammer and was pleased with them. Magnificent blood trail. I shoot a 360gr arrow. Its lethal on deer and hogs....elk, Im not sure. no experience with elk using them. but have killed many deer and hogs with them. Your bow sounds like it may be out of tune. Have you paper tuned with field points recently? For most whitetail scenarios (40 yds and less) I would think paper paper tuning with a fletched arrow at 5 yds would probably get you pretty good broadhead accuracy out to 40 yds. However, if I’m in your place and 50-60 yd shots (or longer) are a possibility I would probably bare shaft tune followed by walk back tuning. It’s a very time consuming process though. I just finished doing a standard paper tune and it was not a single session exercise. We had to do It over 2 days and had to deal with weird inconsistent results that we only figured out were due to a couple of my arrows (pro tip - use a sharpie and number each of your arrows - you’ll pick up on issues quicker if #3 and #5 are always tearing different than the others). What are some factors that would cause my bow to be out of tune? Use the mechanicals if you already purchased them. Just stay away from the front shoulder. Elk have huge lungs and you don’t have to be that snug to the shoulder to get both lungs. That's my plan LOL. I got my bow close to tuned with the slick tricks so figure to mechanicals should fly like a dream. I’d still sight in with the Slick tricks and use them for the elk, deal with the bow tuning when you get back. A buddy shot a bull with one two weeks ago, it went in front of the on side shoulder and hit the bone on the off side. It sounded like a baseball being hit with a wood bat, blood trail was really easy to follow even without an exit, and the off side shoulder meat was blood shot like it was killed with a rifle. The arrow had broken up into several short sections and went completely inside the elk and the broadhead was undamaged and still sharp. Im sure he has already gone on the trip and come back home by now. Wasp makes a very good head. Ive been imorrssed with the ones Ive shot but I still wouldnt want to launch such a light arrow at elk with mechanical broadheads. For what its worth. As has been said, Wasp makes quality heads, I shot both the Jak hammer and sst boss for years, killed lots of animals. Only trouble I had was a doe I hit square in the shoulder with a jak hammer. But that was my fault.